Franklin High School Modernization a $113 million investment in Southeast Portland is now open. 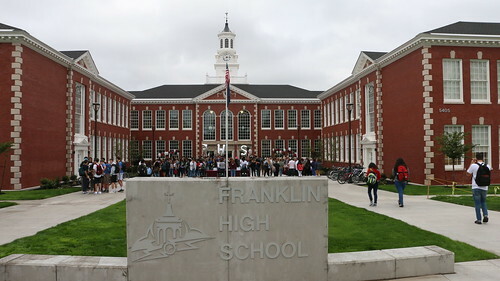 Franklin High School is one of three high schools that are being modernized with funds from the 2012 School Building Improvement Bond. After two years of hard work, the new Franklin High School welcomed its staff and students back to a state-of-the-art campus. In a powerful opening day ceremony members of the school’s Link Crew lined both sides of the Grand Staircase and cheered on students entering the front doors. Teachers are already incorporating their new equipment and facilities into their curriculum plans and sports teams are enjoying the new gyms and rotated track and field. The new Student Commons is serving lunches and offering students a gathering space. Students are also taking advantage of the numerous open learning spaces throughout the campus. In the fine arts wing highlights include a new 500 seat theater, black box theater, a dance room with lots of natural lighting and a spacious band room with practice rooms. The historic auditorium was transformed into the new media center with classrooms, including the constitutional law class, located just behind the former stage area. As part of the modernizing process, the environmental health and safety concerns that have been found in schools throughout the District, including those involving lead, asbestos and radon, have been completely remediated at Franklin. The new Franklin will be fully accessible, and has been brought up to current seismic code. The new Franklin campus is undergoing its “shake down” period where all the new facilities and systems go through real world testing with students and are adjusted as needed. Construction crews may still be seen at times on the campus but the majority of “punch list” work will be done after school hours. The eastside pathway to the gym will remain an active construction site for a few more weeks as crews install the steel covering and solar panels over the walkway. Franklin has left the Marshall Site. Phone service connection will begin August 8, 2017. Access for the general public to the new Franklin site cannot occur until student registration on August 14, 2017 due to completion of projects and public safety. At the West wing of the historic 1915 building, interior construction is complete. Outside, landscape work has begun. At the main lobby of the historic 1915 walls have been painted, furniture is being placed and electrical systems, including lighting and door access control systems are now being installed. Equipment for classrooms and administration offices, from the temporary Marshall campus, have been moved over. At the East wing of the historic 1915 building, furniture and fixtures for the new media center have been installed. Reclaimed seating from the original auditorium has been installed at the “group learning” area of the new media center. The basement classrooms are finished and furniture has been installed. At the Performing Arts Center, the stage curtains are up at the main stage and in the black box. Signage in the main lobby has been installed and the concession stand equipment has arrived. Exterior site work is progressing with landscape work, irrigation systems and fencing being installed. At the CTE/Maker Space areas, classroom furniture has been distributed and installed. At the Student commons area, kitchen equipment, student cafeteria furniture and outdoor seating has been installed. Finish furniture at the counseling office has been placed and additional equipment and fixtures from Marshall are arriving back at Franklin. Throughout the campus, exterior site work continues with top soil being spread in all areas that will receive plantings and grass. Trees and shrubs have been delivered to the site and are being planted. The sports complex athletic field installation is complete and has now been painted. Countdown to the August 29th opening. Franklin High is heading fast toward an August 29th reopening. As anyone who has passed by the construction site can see, the work on Franklin in its final stages. Along Division street, the new Gym/Biomedical/Culinary Arts building has been completed. The building houses both a main and auxiliary gym, locker rooms, weight room and classrooms where Franklin’s sports medicine program can work directly with student athletes. Franklin’s Culinary Arts program will take advantage of new building’s professional kitchen facilities. The new building also celebrates the heritage of Franklin with a gym lobby that is paneled with sections from the original gym’s wood floor. Alongside the gym, installation of the turf on the realigned field has begun. The football goal posts will soon be ready for installation and walkways retaining walls, and the concession stand are nearing completion as well. Along 52nd street, the new Performing Arts Center is nearing completion. Designed to serve as the gateway to the new campus, the two-story lobby offers plenty of windows, decorative wood paneling and a large oval of acoustic ceiling tile. The lobby will become the new home for the beloved wooden Benjamin Franklin statue. In the main theater, the seats have been installed and control booth is almost complete. Elsewhere, the band room and dance classroom are now done while the new Black Box Theater is undergoing finishing touches. The CTE/Maker Space areas are connected to the west end of the building along Woodward Street. These are also entering the final stages of construction. New wood and metal shops will provide greater opportunities for these thriving programs at Franklin. The new Maker Space area is virtually complete. It is a large open area that acts as the connector between the 1915 building and the new structure. It is designed to be used by a variety of teachers and programs who want to provide more “hands on” experiences in their curriculum. In the new Student Center building on the east side of campus, the dining area floor has been polished and the walls painted. A highlight of the design is the placement of the original gym’s wooden center court Quaker logo into the floor of the student dining hall. All the kitchen equipment, including the walk-in freezer and refrigerator have been installed. At the west wing of the historic 1915 building, interior construction is complete and ready to be inspected. The west wing will house a number of science and general education classrooms. In the East wing, the former auditorium is transforming into the new media center. A new barrel ceiling with impressive light fixtures is complete while the first floor has been drywalled and ready for painting. At the basement level, all the classroom spaces are nearly complete. In the main lobby of the 1915 building, two new grand staircases have been delivered and are now being installed. This more open entryway will immediately give students an inspiring and welcoming feeling as they embark on their journey at the newly modernized high school. 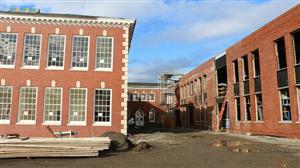 West wing of 1915 building nears completion. The main historic 1915 building is currently undergoing the greatest construction activity. At the West wing all work, interior and exterior, is substantially complete. Interior classroom spaces are finish painted, student lockers installed and finish flooring is done. Administrative offices and lobby entrance on the first floor are nearly complete. In the East wing, the barrel ceiling has been completed with impressive light fixtures and ventilation system fixtures in place. On the first floor, the new media center and classroom spaces have been dry walled and primed. On the lower floor, all classroom spaces are complete and the majority of walls have been finished painted. Outside the clock tower renovation is making significant progress. At the Performing Arts Center, architectural metal siding, sunshades and glass enclosure systems have been completed. The main entry doors are all that remains to finish. Theater work continues with the control booth nearing completion and the stage floor installation underway. At the CTE/Maker Space, student lockers, dry erase marker boards, cabinets and finish flooring are completed. The Maker Space area has cabinets, plumbing and mechanical systems installed. The concrete floors of Student Center have been polished. The walls are painted and kitchen equipment has been installed. The Gymnasium/Biomedical/Culinary Arts building is substantially complete and furniture is beginning to be loaded into the classrooms. The nearby athletic field area is being leveled and graded in preparation for the installation of the turf and the football goal posts. In the Performing Arts Center auditorium, the backstage rigging equipment, counterweight systems and pulleys have been installed. All foundation work in the auditorium seating areas is complete and soon the wood paneling system at the walls and ceiling will begin. Work on the main elevator system is also underway. On the exterior, the two-story glass storefront enclosures, at the West and South elevations, will soon be complete. At the CTE/Maker Space, finish paint on interior walls, marks the drive toward completion of both the 1st and 2nd level of the classroom and workshop areas. In the new dance studio, the beautiful hardwood floor has begun to be installed. In the historic 1915 building drywall and finish coats of paint have brought classrooms, conference rooms and administration spaces closer to completion. Crews are even up at the clock tower, performing some structural repairs to the clock. At the Student Commons, the walk-in freezer and coolers have begun to be assembled and installed. Upstairs, counseling and student support service offices are almost finished and the final coat of paint is being applied. Handrail systems at the second level balcony and an adjacent stairway, have been welded into place. In the Gym/Biomedical/Culinary Arts building the historical heritage of the 101-year-old school is being showcased. Wood panels, salvaged from the original gym floor are being used as a decorative wall panel system at the trophy case area of the main gym lobby. Elsewhere the “Culinary Arts” classrooms will soon be ready for the kitchen equipment to be moved to final positions. At the main and auxiliary gymnasiums, all bleacher seating is now in place. Elsewhere, the classroom areas have had all specialty equipment installed. Outside, the work on the athletic field area signals the start of one of the final phases of active construction at Franklin. As the New Year begins under a blanket of snow it’s a good thing that most of the work on the Franklin has moved indoors. In the Performing Arts building, concrete pours for the auditorium seating areas have begun. Work on the mechanical systems at the stage should soon be completed and the “Black Box” Theater has been insulated. At the Lobby entrance on the South side the adjacent hallway and glass “storefront” is nearly complete. At the CTE/Maker Space interior walls are now being painted on both the first and second floors. Installation of the dance studio floor has begun and Interior wall paint is nearly done. In the historic 1915 building work in the West wing has progressed dramatically. Electricians have begun to wire all interior light fixtures and installation of specialty items, such as sink fixtures and lab equipment is underway. Finish paint is complete on most walls and new cabinets are being installed. Structural work for the new, main entryway staircases continues with installation set to occur in the next couple of months. On the East wing at the new Media Center/Library a new staircase has gone up and walls are being framed on the second level. The new Student Center on the Southeast side of campus has a transformed interior. New finish paint and wall covering in the kitchen is almost finished. The new gym has seen spectacular progress both hardwood floors of the main and auxiliary gym are in with only the application of a final finish to be added. The newly installed seating areas offer a compelling view from center court of the main gym. In the Culinary Arts classroom, the kitchen’s mechanical and ventilation system are almost finished. It’s worth noting that pieces of the original Franklin gym floor were salvaged and are being installed as architectural elements near the trophy case area to celebrate the long history of the school. Outside the new gym, the seating areas and concession stand are nearly finished. Signs of robust progress can be found throughout the Franklin construction site as 2016 comes to a close. Nowhere is this more evident than in the new gym/biomedical/culinary arts building which will be completed around February of 2017. With the exterior nearly done the focus is now inside where cabinets and countertops in classrooms and offices are being installed. Ceilings and light fixtures have been installed throughout the main lobby, hallways and classrooms. In the locker rooms the lockers were installed and finish flooring has begun. Another significant milestone was achieved when the hardwood floor of the new gym was installed before the Thanksgiving holiday. Great strides have also been made at the Performing Arts building. The auditorium has been framed, drywall is being installed and painting has begun. The backstage area of the main stage and the black box have been darkened out with black finish paint. Currently crews are setting concrete forms in preparation for the auditorium seating area work to begin. 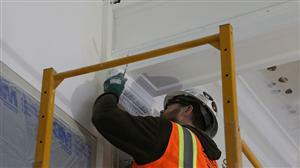 At the CTE/Maker Space, interior walls have been insulated and drywall installed on the first floor. Concrete stairs and handrails have been completed for the new stairway. On the exterior, almost all the windows frames have been installed. In the new Student Center, interior framing and mechanical/plumbing systems are nearing completion. Insulation and drywall work has begun on the first floor and will soon be moving to the second floor. At the main historic 1915 building entrance, all existing structural wood framing has been removed and the floor is currently under repair so that new staircase installation can begin. The administration offices and student store are taking shape again, with drywalling and painting underway. In the West Wing of the historic 1915 building, the new classroom spaces are nearing completion with the addition of cabinets, countertops, lab equipment, new ceilings and finished flooring. The stucco walls and ceilings of the original stairways have been repaired, enhancing the finish quality of the space. In the new Media Center/Library in the East Wing all the subflooring and framing has been completed. Elsewhere, window restoration continues while the mechanical systems progress toward completion. Lower level classrooms and office space facilities are framed and will soon be ready for drywall installation. Outside at the new concession stand area, exterior walls, roof trusses and the sub roof are complete. The new grandstands with a new press box and bleacher seating areas have seemingly grown up overnight. The athletic field lights are in place and ready for hook up. Throughout the campus, site work continues with ramps, roadways, sidewalks and parking lots being paved, poured or prepared for new, finish surfaces. In the Performing Arts Building the brick and masonry veneer exterior walls are nearly complete. Concrete has been poured and finished for all second level hallways and catwalks. Painting of the main auditorium has begun and should be completed in the coming weeks. At the CTE/Maker Space building all steel framing has been finished. Overhead mechanical, electrical plumbing and window frame installation is nearing completion. Window installation has begun along the South and East exterior walls. Brick work on the exterior walls is finished. At the main historic 1915 building all structural steel has been completed. The grand stairs at the main entrance is being prepared for installation. The overhead work of mechanical, electrical and plumbing is nearing completion. Insulation and drywall are going up in rooms throughout the building in preparation for painting. Finish painting, at the West wing of the historic 1915 building is nearly complete and at the lower levels and flooring is going in. The cabinets have arrived for installation. The upper level and all stair ways of the West wing should be ready for finish painting within the coming week. At the new Student Center all exterior brick has been finished and all interior framing and mechanical / plumbing systems are nearing completion, ready for inspection and covering with drywall. The exterior of the new gym/biomedical/culinary arts building is nearing completion and interior finish work is well underway. Installation of cabinetry and countertops are in progress. The basketball backboards and scoreboards at the main and auxiliary gyms have been installed. The hardwood flooring has been delivered and is being prepared for installation. The plumbing fixtures such as sinks and drinking fountains have been delivered, stored, and are ready for installation. At the concession stand area, the walls have been finished. The new grandstands are scheduled for delivery the beginning of November. Site work is also well underway. The new staff parking lot at the east side of the campus is ready for asphalt paving. Soon the areas between the new gym / culinary arts center and the main school building will have concrete work for walkways formed up and ready for concrete to be poured. On November 1st school staff turned over the Franklin time capsule to the modernization contractor Skanska for later installation. The contents consisted of a variety of items, donated by teachers, staff, alumni, students, etc., which includes old yearbooks and Franklin gear (shirts, pom poms, cups, mugs, etc.) and plans for the new school. The time capsule was created by FHS student Shane Tavares and set to be opened in the year 2117. A sign of the considerable progress happening at the Franklin site was reached when ‘Big Ben’ was moved back into his final location overlooking the new track and field. At the Performing Arts building waterproofing of the exterior has been completed, the installation of exterior brick has begun and the decorative spiral staircases have been set in place. Metal framing of the walls has been completed along with plumbing and mechanical work on the main level. Installation of roof membrane is now underway. In the new CTE/Maker Space framing on the main level is complete along with framing and drywall installation on the second level. New window frames are being installed on both levels together with sound-proofing insulation over the shops and classrooms. Roofing has been installed as well as photovoltaic panels. Exterior brick veneer installation is complete along the East wall and progressing on the West and South walls. The exterior brick veneer at the Student Center nearly complete while framing and overhead mechanical installations are in progress. Installation of the frames for the new windows is also nearing completion. The renovation of the historic 1915 building continues with framing, drywall, painting, and ceiling grid installations highlighting the build-back of the previously demolished classrooms. Demolition of the remaining structure in the main lobby is taking place in preparation for the installation of the new grand stairs. Mechanical, electrical, and plumbing rough-in work is being completed throughout the building. Installation of the rehabilitated historic windows continues as well. The brick veneer on the west side of the new Gym/ Biomedical/ Culinary Arts building has been completed. With drywall installations and painting on all levels in progress, the interior is shaping up. The installation of the new elevator has also begun. The concession stands and grand stands have begun to take shape as well. The base slab for the concession stands have been placed as well as the footings for the new grandstands. Plumbing rough-in also began. Site preparation continued continues with the backfill of the bus turnaround and stairway/ramp South of the new Athletic Building. For all other project documents visit the FHS Document Archive page. In the lower levels of the older building portions of the existing concrete floors have been removed in preparation of installing seismic upgrades to the existing historical building. The seismic work also includes reinforced concrete shear walls that will soon be formed and poured. Franklin High was awarded a $1.3 million dollar grant for seismic rehabilitation. Learn more here. Work on the covered walkway (with solar panels) from the main buildings to the new gym will continue for a few more weeks. The award winning DOWA-IBI Group/SERA Architects is the project design team for the modernization of Franklin High School. Skanska is the prime contractor for the modernization.